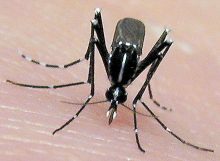 The Florida rain and summer heat create an ideal environment for mosquitos which can lead to an increase in the spread of diseases transmitted by mosquito bites. “All sorts of viruses are being transmitted by mosquitoes, yet we don’t fully understand the rate of disease transmission,” said J. Glenn Morris, M.D., M.P.H., director of the UF Emerging Pathogens Institute. Morris was the corresponding author on a report about the Keystone virus, which was recently identified in humans for the first time. Keystone is part of a group of viruses that can cause a mild fever but in severe cases can lead to brain inflammation, known as encephalitis. Another mosquito-borne disease that has recently spread to Florida is the Zika virus. Zika, which was discovered in 1947 in Uganda, was considered to be a harmless virus causing only mild discomfort until a 2014 outbreak in Brazil lead to a rise in cases of microcephaly, or “small head,” in newborns. When Zika arrived in Florida, swift action from the Department of Health and CDC helped to limit the transmission of the disease. To learn more, watch this recorded livestream from the Our Community, Our Health national town hall on the Zika virus.